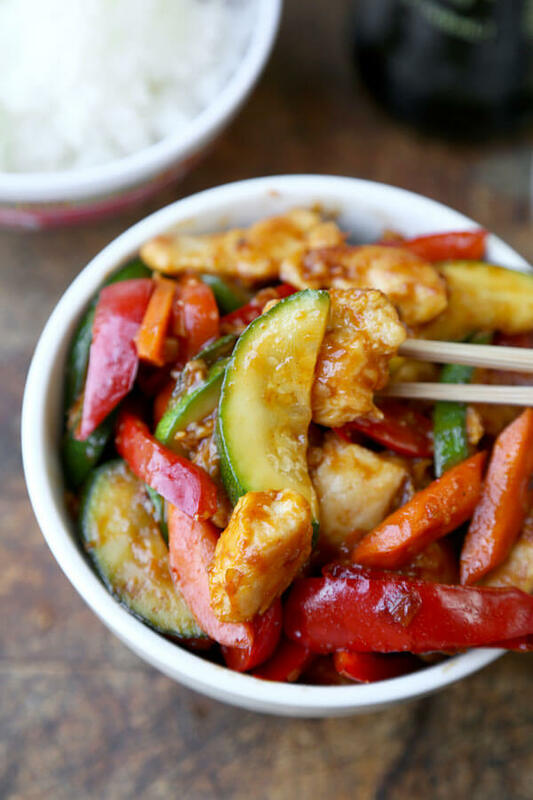 Hunan chicken is a popular Chinese-American dish made with tender pieces of chicken cooked with vegetables and tossed in a thick savory and spicy sauce. Good Monday everyone! How was your weekend? Mine was very chilled and relaxing. I stayed mostly indoors to avoid the crushing heat outside as the first heat wave of the summer has arrived. It’s the kind of heat (sauna like) I can only enjoy by a pool or a beach – neither of which we have. Thankfully we have air conditioning and a small fan to circulate cool air throughout the apartment making our little Brooklyn nook very comfy! When it’s this hot, I stay away from the oven and try to keep the use of burners to a minimum. 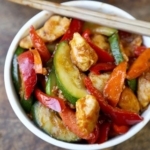 Making quick dinner recipes like cold salads and soups (we have had gazpacho just about every day last week) are better option as well as making an easy stir fry like this Hunan chicken recipe. I L-O-V-E Chinese food. I spent three years living and working in Hong Kong, Singapore, Taipei, Shenzhen and Shanghai so I consider myself fairly well informed about Chinese food. And while it’s obvious that authentic Chinese food is mind blowing delicious, I still grew up eating American-Chinese food and get cravings for it. 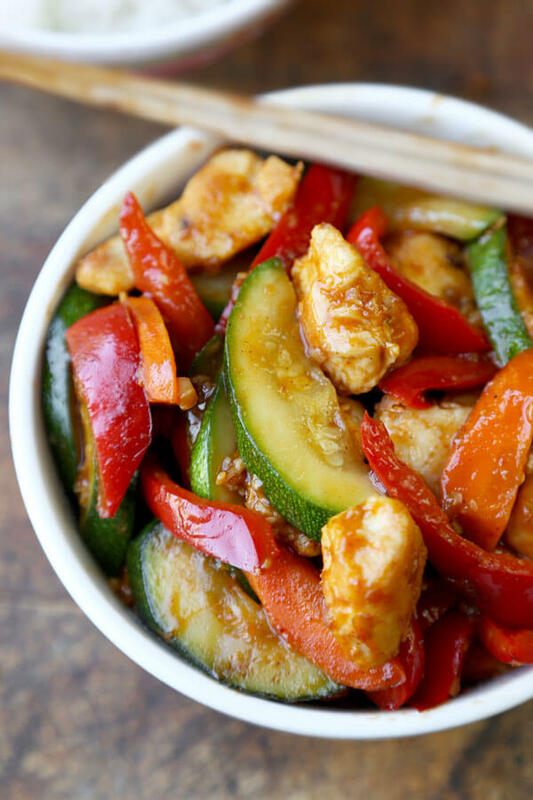 Hunan chicken is one of those dishes that was altered by Chinese restaurants (like general Tso chicken) in order to please the American palate. Its original taste is more hot and spicy than tasty. However, the Hunan chicken recipe we are used to eating here in the USofA is sweeter, more savory and less spicy. The real Hunan chicken also comes with bone-in chicken pieces and contains vegetables such as scallions, peppers and chiles. I’ve tasted both versions and can honestly say I enjoy both of them. Maybe it’s because they taste so different that it feels like I am eating two completely different dishes! I grew up eating Chinese buffet food from places with names like Jade Palace and Imperial Garden so you can see why a dish like Hunan chicken with a little sweetness is appealing to me. I didn’t discover really spicy food until later in my life – my mother (like most Japanese people) never made anything spicy since she couldn’t handle the heat. It wasn’t until my first trip to Thailand that I got my first taste of mouth numbing – eyes popping out of my sockets – I’m going to die if I don’t drink water like right now spicy. And I fell in love with it instantly. I fell in love with the chile sweats and the cooling effect that soon followed a slurp of tom yam boran soup. I think it’s great that Hunan chicken can be offered two ways because it means I can get my Hunan chicken fix Szechuan style or American style! 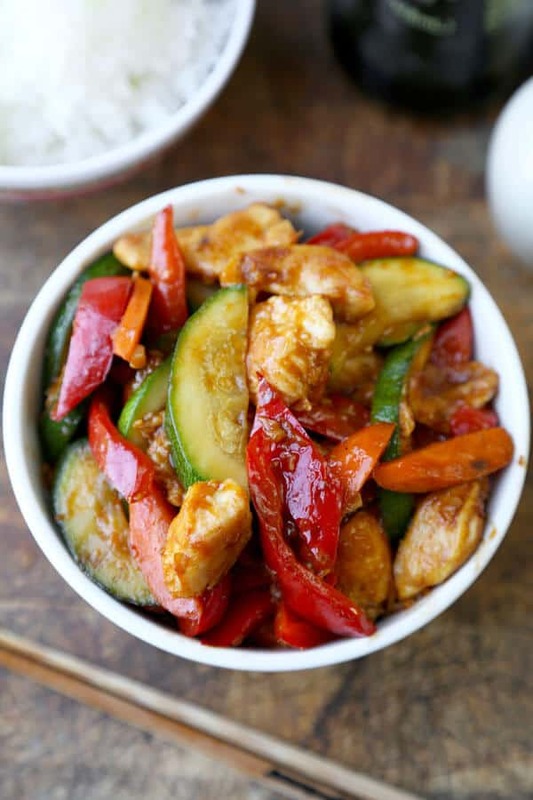 My Hunan chicken recipe is very simple and packs a punch in taste but not spiciness. It’s spicy enough to make you go “oooh!” but not enough to make you want to call the fire squad. I chose a mix of zucchini, red bell peppers and carrots to stir fry the chicken with but you can use your own combination of vegetables too. I find that zucchini stir fries exceptionally well and texturally enhances the dish. It’s become one of my go-to vegetable for stir fries! You can serve this Hunan chicken recipe with white rice and some side dishes such as dry-fried green beans, vegetable chow mein noodles, stir fried glass noodles with shrimp. 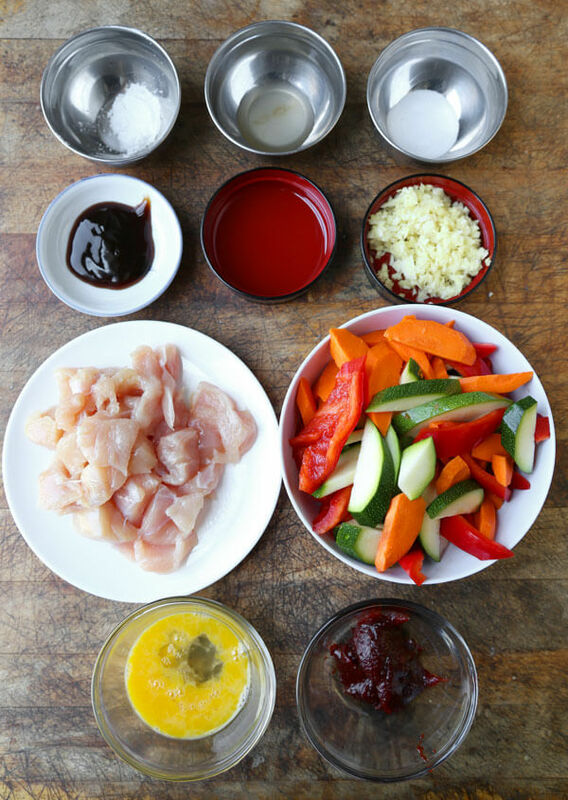 Did you like this Hunan Chicken Recipe? Are there changes you made that you would like to share? Share your tips and recommendations in the comment section below! In a bowl, combine egg and cornstarch and season with a little salt and pepper. 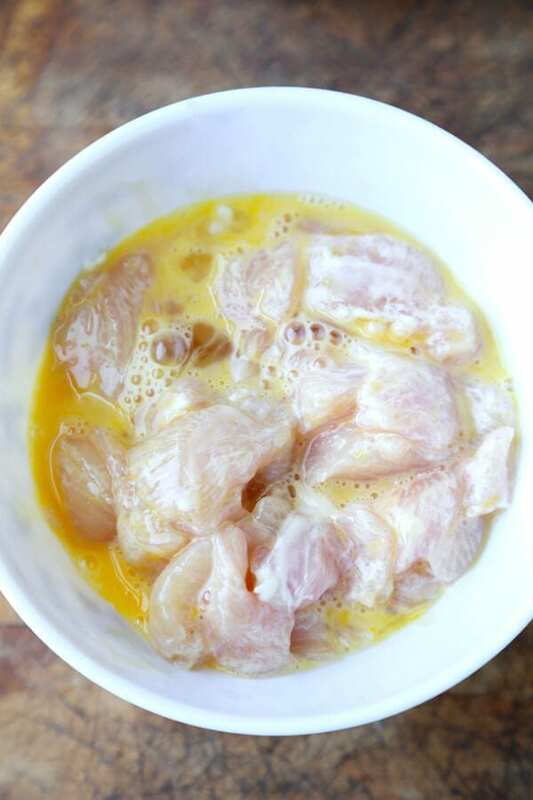 Add chicken pieces and marinade for 5 minutes. Add all the ingredients for the sauce into a bowl and whisk until well blended. 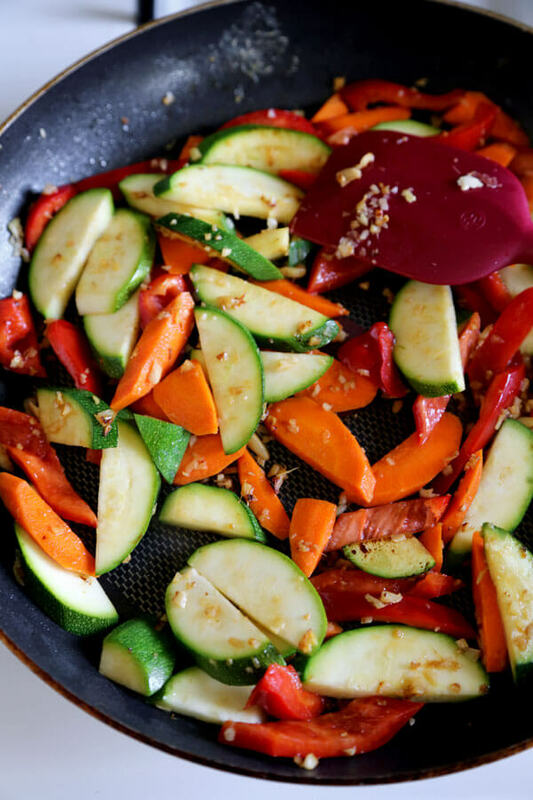 In a large pan over medium high heat, add 1 tbsp vegetable oil. 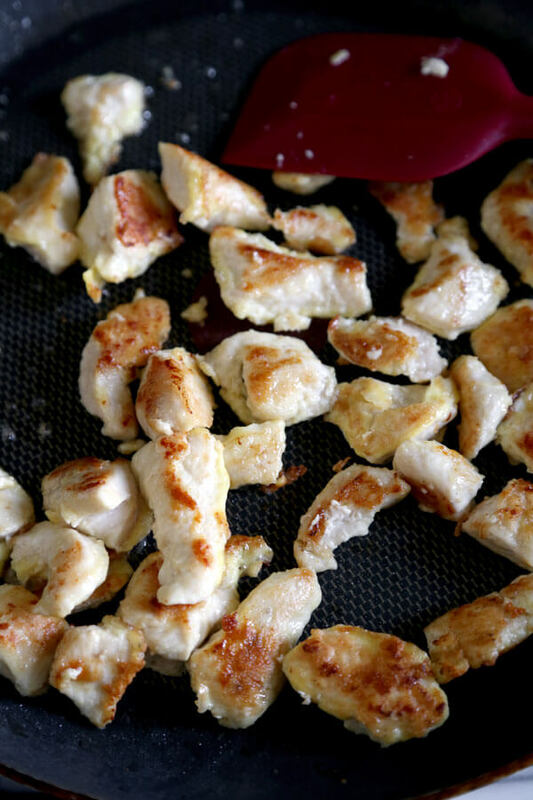 Drop chicken pieces and cook until both sides are golden brown. Remove chicken from the pan and set aside. Add remaining 1 tbsp vegetable oil to the pan (still over medium high heat) and add garlic and ginger. Cook for 1 minute and add vegetables. Cook for 5 minutes. Return chicken to the pan and add sauce. Stir and coat vegetables and chicken for 1 minute and turn the heat off. 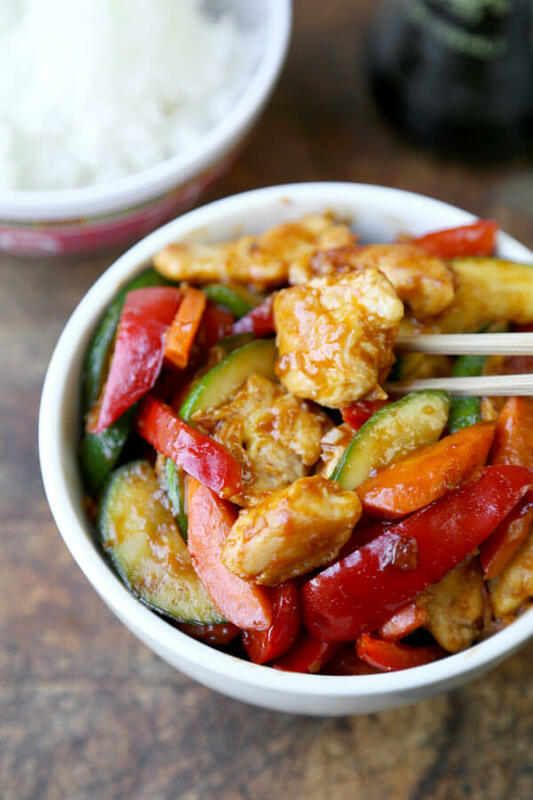 Transfer to a plate or bowl and serve Hunan chicken with a side of white rice. If you ran out or cannot find chile bean paste, substitute it for 2 tsp gochujang. Wow! Wow wow WOW!! !This is an awesome idea! I love learning how to make things. Thank you for this recipe! Thanks for Sharing ! I absolutely love this recipe! I’m going to try to mix it up a bit tonight and use Chinese barbecued pork instead of chicken and chili crisp instead of chili bean paste (I ran out). I’ll be trying all of your other Chinese recipes after I’ve had enough of this one. Thank you for sharing them all! How fishy is the oyster sauce? Im not a fan of fishy flavors. Hi Dara, I personally don’t find oyster sauce fishy. I find it rather sweet and savory than anything else. You can substitute with soy sauce though since 1 tablespoon won’t make that much of a difference. So many recipes call for either oyster sauce or fish sauce…neither of which I want to use. How else can I make the taste come out authentic? Hi Brenda, that’s a tough question. Do you have allergies or are you vegan? I made the Hunan chicken last night after making the spicy asparagus chicken stir fry the night before. Both were positively delicious!! The chicken was was so smooth and tender and the dish was filled with spice and flavor. My wife and I loved them both. My wife is calling me a chef…haha! As someone new to cooking Asian food, I must compliment your concise approach and attention to detail with your recipes. Your commentary and explanation of ingredients are most welcome. I must admit however it was the beauty of your photography which pulled me in. Who wouldn’t want to eat food you make so beautiful with your photographs? I look forward to working my way through many more recipes. Tonight I will try the Korean sticky chicken. Thank you so much!! This recipe is soooo good! I am always looking for Chinese recipes on Pinterest and have gotten so frustrated because nothing taste like authentic Chinese food. Every other recipe I have tried is always too sweet and and not savory. This Hunan Chicken is a game changer! It is savory and delicious! I can’t wait to try the other recipes on this website! Thank you Janie! 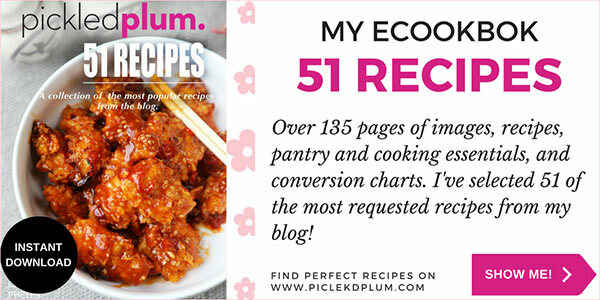 I totally agree with you about having a hard time finding authentic Chinese recipes! I also have a hard time finding good Thai recipes that taste like what I used to eat in the streets of Bangkok. Very happy you liked it and I hope you enjoy all the other recipes as well! quite good and the balsamic resembles old time Chinese Aged Black Vinegar. That sounds wonderful David, thank you for sharing! This was such a hit! The sauce was awesome and I got away with feeding my family sooo many veggies! Not that this is a particularly high sugar recipe, but do you have any substitution ideas to cut it out completely without sacrificing too much taste? Thanks. That’s wonderful Justina! I think you can get away with omitting the sugar entirely and still have the dish taste good – or replace it with a little hoisin sauce. Let me know how it turns out next time! Tried this tonight though i did make a few adjustments first I pretty much doubled the recipe and added celery, yellow squash and water chestnuts to the veggie mix. I ended up tripling the sauce minus 2 Tbsp. 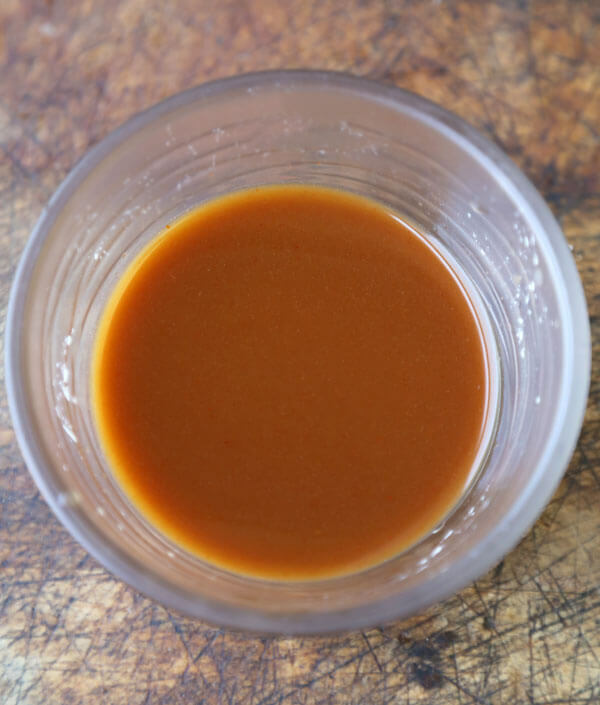 of chili paste and replaced the apple cider vinegar with rice vinegar and put a small splash of sesame oil in it. This turned out to be a big hit though my daughter thought it was a bit too spicy. Thanks for sharing. I ordered this in a restaurant and really liked it. Your recipe sounds like a similar one, but I was wondering if you knew the original one; the one that’s spicier? Hi Matt, you can easily make it spicier by adding more sambal oelek (chile bean paste). This should bring it close to what you tasted at the restaurant. Let me know how it turns out! I’ve tried a few Hunan recipes and this one is he closet to the restaurant. AWESOME!! Thanks for posting. I’ll be trying your other recipes too!!! That’s so great to hear Brian, thank you! Such a healthy meal and so yummy! Thank you Caroline! I added more veggies than chicken and my husband absolutely loved it!